There are plenty of reasons to switch to a more natural beauty routine, but pregnancy seems to be a period when many women first dip their toes into clean beauty waters. Bee Shapiro, the beauty columnist at the New York Times, was no different. 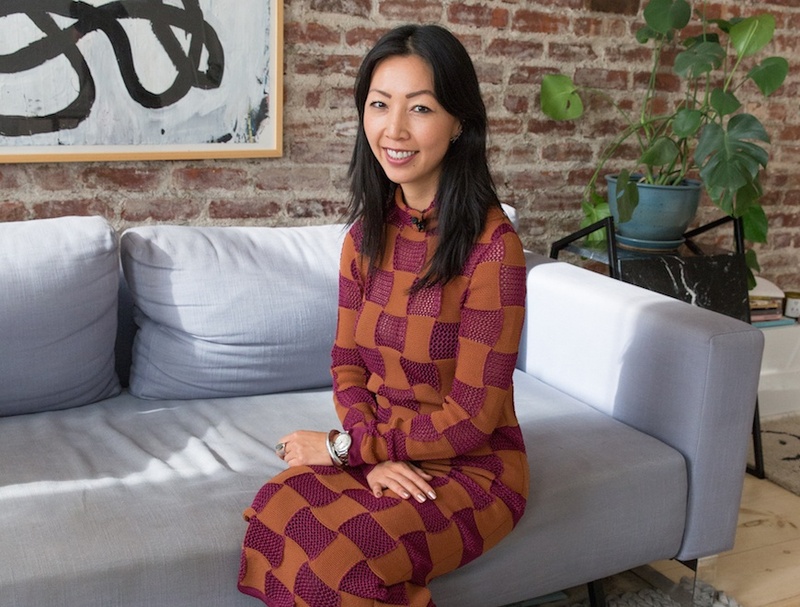 Around the time when health-first beauty brands just began to eclipse fashion-forward trends, Shapiro found out she was pregnant with her first baby girl and began looking for alternatives to slather on her skin. But there was a gap: Fragrance was largely left out in the sea change of clean beauty. In part, this is because fragrance has notoriously been a sore spot for wellness-savvy label readers. Brands still don’t have to disclose the actual ingredients that fall under the “fragrance” umbrella, meaning that the word can become a place for icky (and iffy) ingredients to park it without anyone knowing. So, as a side-hustle, she set forth to create a line of better-for-you scents (and now candles and body care) known as Ellis Brooklyn. Fast forward 3 years, and the sizable brand is now carried in retailers like Sephora, Barney’s, Credo, and Net-a-Porter. Here, she talks about why she created the line, what’s it’s been like to be a boss babe, and why she swears running helps her think. Keep reading for Shapiro’s career intel and advice. What was the turning point in your career when you decided to create a beauty brand? I came from fashion reporting before beauty, and I always thought the fashion-beauty connection was great, but also kind of forced. I think the beauty-wellness connection is better and more positive. The weird part was that I saw [beauty brands cleaning up their formulas] across makeup, skin care, and hair care, but not really fragrance. I thought it was so weird that the fragrance industry wasn’t changing, and I was frustrated because I was pregnant and wanted to smell nice without putting on stuff I was afraid of. I thought there must be a better solution—you could either pick from oils at Whole Foods or spray on your designer fragrance. When I set up the brand, I had a lot of pressure to be 100 percent natural. As I was formulating with a perfumer and allergen and safety testing, a lot of the times these completely natural options were not the safest and weren’t necessarily less of an allergenic formula. Those were the things I was really keen on, so I decided not to be all-natural just for the sake of marketing. The idea of this line was never to be a marketing ploy—I wanted to be really honest. It’s interesting to see how the conversation has changed just in the last year or two and become more accepting of synthetics sometimes being better options. What’s your favorite part of having your beauty brand? I realized that you can’t build it all on your own. I asked for so many favors. I love other female beauty entrepreneurs—I feel like you get so much information from them. One of my favorite parts of running Ellis Brooklyn is talking to these other women. There are so many great ones in beauty that have been through it all, and we share stories. Interestingly, once you get in the field, the founders really do all know each other. What’s your advice for people who want a successful side hustle? The thing I’ve really learned from Ellis Brooklyn is that side hustles start to take on a life of their own. At this point, it’s not my side hustle—it’s my main thing. When you really start to get traction and a lot of great supporters, on one hand you have control over your growth, but on the other hand, you really don’t. If you’re growing, you’re going to get into more doors and suddenly it’s much bigger. I would definitely say that for anybody who wants a side hustle, don’t really start it unless you can envision it overtaking your career in a good way. It’s a different set of challenges. I recently interviewed Neil Blumenthal of Warby Parker for one of my columns, and he had a really good tip that I’ve been mulling over a lot. He said he never strives for work-life balance—he strives for work-life integration. For entrepreneurs, that makes a lot of sense because it never really stops. It’s not like I can fully check out for a week. What does work-life integration mean, though? You don’t want one necessarily over-running the other. I’m super fascinated by the culture of work. I love the idea of thinking about what satisfaction means, and I think these are questions our generation cares a lot more about than maybe two generations ago. I put everything in my Google calendar. I end up moving the blocks a lot because I don’t end up finishing what I was supposed to be finished with. Those are the days where you kind of wade through. But I definitely find physical activity really important and mind-clearing. I’m not a good runner, but one of the best ways for me to clear my mind is running. I really believe that the physical inspires the mind. I learned this from writing. If you have writer’s block or don’t know what to do next or feel paralyzed because you’re overwhelmed, I think that getting your body into physical action actually helps a lot. Where do you see the future of beauty going? Wellness and beauty will continue to become more intertwined. And for better or for worse, there will be more entertainment-driven beauty. The other day, I saw a mask that had glitter in it—it had zero function whatsoever except for selfies. I think we’re going to see more of that. With this shortened product cycle and so many products coming out, the one upside I see is that brands are devoting more to research and development than ever before trying to push the envelope and change things up. And I think there’s more to be done in the ingestible space. That space is the wild wild west—there’s no kind of rule. It’ll sort itself, whether doctors will get more involved and prescribe a regimen or some ingestibles go away. Maybe it’s a vitamin you smear on your body and you absorb it—I’d be curious to see what’s next. Speaking of ingestibles, these are some beauty supplements from Sephora that’ll make you glow from the inside out. And here’s what you need to know about drinking collagen.